Ashtone Morgan has Toronto FC sitting in a good place heading into the second leg of its CONCACAF Champions League semifinal. The 27-year-old Toronto native’s second-half goal gave the defending Major League Soccer champions a 3-1 opening-leg win over Mexico’s Club America on a wet and breezy Tuesday night. The two-goal advantage will be huge when the two teams meet again next Tuesday at Estadio Azteca in Mexico City. Sebastian Giovinco and Jozy Altidore scored first-half goals for Toronto (3-1-1) before a damp but energetic BMO Field gathering of 23,463. The Reds remain unbeaten at home in the competition (2-0-1) and earned MLS just its second win in 11 CONCACAF semifinal meetings against Liga MX squads. Andres Ibarguen replied for Club America (3-1-1). The contest was marred by a half-time altercation in the tunnel as the two teams left the field. 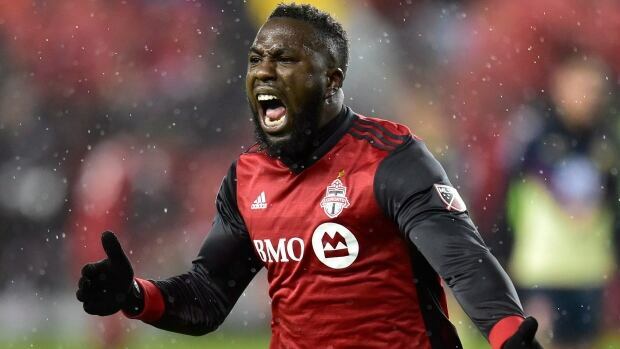 Last November, a scuffle broke out at halftime of Toronto FC’s 1-0 home loss to the New York Red Bulls in an Eastern Conference semifinal game at BMO Field as Altidore and New York’s Sacha Kljestan were sent off following the melee. Club America coach Miguel Herrera alleged through a translator two Toronto police officers were physical with three of his players. He added two CONCACAF staff members witnessed the incident and was hopeful they’d report what they saw to the proper officials. Herrera also criticized the officiating. He said referee Henry Bejarano came into the Mexican team’s dressing room before the game and told players to change their underwear. Toronto head coach Greg Vanney offered a different take on the half-time incident. “I was front and centre and saw everything,” he said. “I’m not really going to digress into he said, she said. Then Vanney said the incident began when a Club America coach interacted with Giovinco and Toronto FC’s Jonathan Osorio came to his teammate’s defence. Osorio, a 25-year-old Toronto native, said a Club America coach elbowed him in the nose. “And then it escalated from there,” Vanney said. This marked the first official match between the two teams although they met in the pre-season as part of Toronto FC’s week-long training at altitude in Mexico City. Morgan gave Toronto its two-goal cushion in the 58th minute, converting a nice setup from Auro Junior. Club America’s frustration was clearly evident in the 69th minute when Guido Rodriguez angrily threw the ball to the field after receiving a yellow card. Toronto FC goalkeeper Alexander Bono kept it a two-goal game with a nice stop in the 84th minute. A persistent rain fell at kickoff and the wind — which was forecast at 39 kilometres an hour with gusts over 50 km-h — made the 3C game-time temperature feel more like -3C. But that didn’t deter the hearty Toronto FC supporters, who enthusiastically waved flags and stomped their feet while chanting “T-F-C” shortly after the teams came on to the field. Giovinco brought the crowd to its feet when he scored on a penalty kick in the ninth minute after being taken down in the box by Club America’s Edson Alvarez. Giovinco was issued a yellow card six minutes later after the two teams came together following some aggressive tackling by Club America. But Ibarguen made it 1-1 in the 21st minute after some nifty ball-handling. Altidore put Toronto ahead 2-1 in the 44th minute. After taking a Giovinco pass, Altidore nicely evaded a Club America defender before blasting a shot past goalkeeper Agustin Marchesin. Vanney said Toronto FC plans to head to Mexico City later this week. He’s unsure how his game plan will change with the club having a two-goal advantage. “We’ll look back at this game and see what nuances we can take out of it,” he said. “There’s a lot of factors that come into play when you go to Mexico City and you have to take all of those into account as we plan and prepare for next week. Club America is Mexico’s all-time winningest franchise, having captured the Liga MX title 12 times. And it came into Tuesday’s match unbeaten and having outscored its tournament opposition 13-3. But Toronto FC eliminated defending Liga MX champion Tigres UANL in the quarter-finals. It also came into Tuesday’s contest off a 3-1 win Friday night over Real Salt Lake, the Reds’ first of the MLS season. Toronto FC isn’t the only MLS squad to reach the CONCACAF Champions League semifinals. The New York Red Bulls host CD Guadalajara, another Mexican side, in their series opener Wednesday night with the second leg also going Tuesday in Mexico. Toronto FC is in the CONCACAF Champion League semifinal for just the second time. It also did so in 2011-12, falling to Santos Laguna 7-3 on aggregate. The LA Galaxy is the last MLS team to win the CONCACAF title, doing so 17 years ago. Since then, only two league teams have reached the final, including the Montreal Impact in 2015.